The Adventures of Ichabod and Mr. Toad is an animated feature produced by Walt Disney and released to theaters on October 5, 1949 by RKO Radio Pictures. It is the eleventh animated feature in the Walt Disney Animated Classics series, and the final of the six package films produced by Disney, following Saludos Amigos, The Three Caballeros, Make Mine Music, Fun and Fancy Free, and Melody Time. During the 1940s, much of Disney's feature output was made up of so-called "package films." Beginning with Saludos Amigos in 1943, Disney ceased making feature films with a single narrative, due to the higher costs for such films, as well as the drain on the studios resources caused by World War II, even though almost all of these package films were fairly successful. Instead, Disney features would have two or more stories linked together through a variety of means. 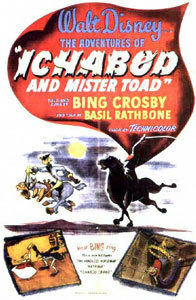 The Adventures of Ichabod and Mr. Toad was the last of these "package" films, and Disney returned to single narrative features with 1950's Cinderella.